It may not have been a full 60 minutes of good hockey, but it was pretty darn close. The Icers Friday night cruised to a 10-1 romp over West Virginia at the Greenberg, improving their record to 7-1-1 on the season and ending the Mountaineers' 5-game winning streak. Speaking of streaks, the Red Line of Tim O'Brien, Domenic Morrone and Marek Polidor had a night, combining for 5 goals and 7 assists. Morrone continued his torrid scoring with the Icers' first hat trick of the season along with 2 assists. O'Brien added his 3rd power play goal of the year (7th overall) and a trio of helpers, while Polidor picked up his 2nd goal to go with a pair of assists. Tim and Dom told me it just took time for the three to get in synch on the ice. Now that they are, they're throwing the puck around like it's on a string. I think it's safe to say the coaches have found their number one line combo. While Tim, Dom and Marek sit 1-2-3 atop the team scoring list, there were contributions through the lineup last night. In all, 13 players counted points. Ryan Paradis finished the scoring parade, getting his 3rd of the season on a breakaway with just 1 second left, giving him a 3-point night. Mike Broccolo potted 2 goals and added an assist, while Dustin Roux picked up a pair of assists in his first game as an Icer. Rich O'Brien and Dan Loucks also had a pair of assists as they continued their strong play on the blue line. Finally, there was a milestone of sorts last night. John Conte's interference penalty in the 3rd period gave John 150 minutes in penalties for his career. Sorry John, but that's a long way from overtaking the Icers career leader. Curtiss Patrick rang up a whopping 325 minutes in the sin bin from 2000 to 2004. Game two of the weekend series with the Mountain men is this afternoon at 3:30. The webcast on Fightonstate.com gets underway at 3:15. As the old saying goes -- "when it rains it pours." First Taylor Cera suffered a high ankle sprain during Friday's game with Drexel, now Matt Kirstein is out after straining a MCL in his knee during Tuesday's practice. What makes it worse is that both Taylor and Matt had just returned from groin injuries. Both are expected to be out of the lineup for at least a month, likely longer. The big problem when they return will be conditioning. As Scott Balboni told me, the injuries will give some of the new Icers a chance to step in, get some playing time and perhaps have an impact. We saw a similar situation last year, giving Marek Polidor and Taylor a chance to impress the coaches. There is a lot of controversy swirling around about the H1N1 flu and the efforts to combat it. Putting all of the political controversy aside, there is an aspect of the outbreak that is having an impact on the hockey world. Paul Daley was hit by the virus a few weeks ago. Judging by his game winning goal on Saturday night, Paul seems to be no worse for wear. Colorado Avalanche goalie Peter Budaj has just been diagnosed with H1N1. According to the Denver Post's Terry Frei, Avs head coach Joe Sacco said Tuesday, "We've taken the necessary steps, the necessary precautions, to keep him away from the guys at the right time." Sacco added, "Hopefully, he'll be joining us on this trip." UPDATE: AP is now reporting Washington Capitals forward Quentin Laing and Edmonton Oilers forward Ladislav Smid also have contracted the H1N1 virus. All kidding about Paul Daley aside, a shocking story from Toronto really drives home how dangerous H1N1 can be. Suddenly, swine flu has a face. A sweet, all-Canadian, little-boy face. Evan died on Monday after coming down with flu symptoms while at a hockey tournament over the past weekend. Click on his picture to watch the Sun Media video interview with his dad, Paul Frustaglio. Mr. Frustaglio is every hockey parent - you, me, Canadian, American, it doesn't matter. No parent should suffer a tragedy as the Frustaglio family. Watch that video and tell me you didn't tear up. Warnings from Hockey Canada were circulating among several teams yesterday, including suggestions that parents keep from the rink any child showing signs of the virus. Teams are also warned against providing sport-drink bottles, where direct lip contact is more likely than traditional water bottles, and towels on team benches. Some leagues have also ditched the traditional post-game handshake. As Mr. Frustaglio said to reporters, "If you guys were talking to me about something else, if there was a train derailment in my backyard, he'd be standing there shooting pucks right now. He loved the game so, so much." Our deepest condolences to the Frustaglio family. Please keep them in your thoughts and prayers. It's Tuesday, and the chance for me to drop by practice at the Greenberg. Saw some spirited hitting today. Let's hope that carries over to this weekend's games against West Virginia. I caught up with Paul Daley after practice to talk about his game winning goal on Saturday, giving the Icers a 4-3 win and a sweep of the weekend series with Drexel. It wasn't easy, but Paul's game winner prevented a third straight Saturday with overtime! I'll be at practice today to get an interview or two, but first it's time to express my displeasure with NHL and its treatment of those of us who are fans of the Canadian teams. Last night I sat down to watch the Leafs in Anaheim, but the NHL Center Ice package on DirecTV only had the Anaheim feed! This morning I crunched the numbers from the DirecTV Center Ice schedule. I wonder why we have to pay the same amount as fans of US teams, since we are getting an inferior product. With less than a month gone in the season, less than half of the games between US and Canadian teams have offered both feeds. None of the games between Canadian teams and none of the games with both US and Canadian feeds offered the Canadian feed in HD. There -- I feel better now! It's amazing what a road trip can do for a team. A solid effort Saturday night in Vancouver, despite losing to Roberto Luongo and the Canucks, followed up by another outstanding effort tonight that resulted in Toronto's first win of the season. Five power play goals in a 6-3 win in Anaheim! Now if the Leafs can just carry the strong play into Dallas on Wednesday night. What's wrong with these pairs of numbers? Those numbers are the shots on goal and final score from Saturday, as the Icers narrowly avoided another Drexel debacle, this time at the Class of 1923 Dungeon Arena in Philly. Once again, the Icers let the Dragons hang around like that pesky little brother we all had. In fact, for the second night in a row it was Drexel that got on the board first, with Jake Davis scoring just 3:27 into the contest. Tim O'Brien tied it on the power play with 1:10 left in the first as the Icers outshot Drexel 17-4, cueing Yogi's "Deja vu all over again" for the 2nd straight night! Same scenario to start the 2nd period, with Gino Angeloni scoring at 1:41. However, freshman Mike Broccolo was finally rewarded for his hard work with his first goal as an Icer at 8:10 and Tim O'Brien notched his 2nd of the night and 3rd goal of the weekend just 50 seconds later. With the Icers outshooting the Dragons 26-6 in the middle period it was the latest episode of the Daniel Pyne show. The Dragons goalie did all he could to keep his team close again last night, with his heroics continuing in the 3rd period. The two teams spent most of the 3rd in Drexel's half of the ice, with the Icers pounding Pyne with 29 shots, while Drexel could only manage 4 on John Jay. The last one by Andy Surawiec managed to slip between John's arm and body. Kyle Zoldy found the loose puck in the crease and scored with 1:23 left in regulation time. Overtime appeared imminent for the third straight Saturday, but Paul Daley saved the bacon just 14 seconds later, going top shelf on Pyne at 18:51. Pyne, who appeared absolutely crushed after the final buzzer, was the obvious choice as first star, with Tim O'Brien and Marek Polidor rounding out the 3 star selections. Honorable mentions go to Broccolo and Joe Zitarelli, who assisted on Mike's goal after scoring his first as an Icer in Friday's win. West Virginia comes to State College next weekend for two games at the Greenberg. Let's hope the Mountaineers don't pull a Halloween trick on the Icers! Coaching victory #100 won't top Scott Balboni's fave list. For the first 40 minutes it looked liked Yogi Berra's "deja vu all over again" could happen. Flash back to November 7, 2008: The icers pumped 71 shots at Drexel netminder Dan Pyne, but wound up on the short end of a 3-2 final score. It was the Dragons' first and only win over Penn State. Despite outshooting Drexel 31-15, the score after 2 was 3-3. The Icers had some good scoring chances, but once again Pyne was on his game. All three Drexel goals came on the power play and a it took a couple of big saves by Teddy Hume to keep it from being a Drexel lead after 2. As 3rd star Dan Petrick told me in the post game interview, something clicked in the locker room between periods. The Icers came out on a mission in the 3rd, outshooting Drexel 18-3, clamping down defensively and putting the game away with power play goals by Steve Thurston and Chris Cerutti sandwiched around Chris' even strength goal. 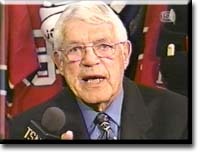 "Sweet Lou" was a force at both ends of the ice. His coast-to-coast power play goal in the 1st period was a thing of beauty. So was Joe Zitarelli's first goal as an Icer, a top-shelfer that was past Pyne before he could blink. Tim O'Brien rounded out the Icers' scoring with his 4th of the season. Tough to see Taylor Cera hobble to the locker room early in the game. His physical presence will be missed while he's out with the undisclosed injury. The Icers will need a better effort tonight to sweep the weekend series. Game time is 7:30 from the Class of 1923 Arena. As far as the current members of the Icers are concerned, there's no jinx at the Ice Line in West Chester. They say it was a lack of effort and not gremlins that led to Saturday's 4-3 shootout loss to the West Chester Golden Rams. It was a so-so performance that came a day after the Icers played 60 minutes of solid hockey in Friday night's 7-1 romp. The Saturday letdown was the latest loss for the team on the main rink at the Ice Line, the 4th straight going back to the 2006 National Championship Game loss to Rhode Island. Watching a spirited practice this afternoon, it looked like the team has put Saturday's loss behind them while they prep another home and home series this weekend. The Icers host Drexel on Friday night before heading to Philly on Saturday in the second straight weekend of ESCHL conference play. Even though the Dragons are 2 and 4 on the season after dropping a pair of games to Rhode Island, the Icers cannot take Greg Marinari's team lightly. They did that last season, and we all know how that worked out -- Drexel shocked the ACHA with the first ever win over Penn State. Ted Hume continued his outstanding play in net this past weekend, although he wasn't thrilled with his performance on Saturday. I caught up with Ted after practice. Like most goalies, Ted marches to his own drummer and he remains upbeat despite Saturday's setback. I wrote about it on Thursday, and it has happened again. Remember back to last December, when the Icers took the opener of the home-and-home with a 3-2 shootout win at the Greenberg, before being handed a 6-4 loss at the Ice Line in West Chester. The main rink at the Ice Line has not been a fun spot for the Icers over the years, going back to Rhode Island's national championship win in 2006. It's long past time to end the curse! Unfortunately, it didn't happen this weekend as Penn State split the home-and-home series with the West Chester Golden Rams. The weekend got off to a good start with a 7-1 victory at the Greenberg Ice Pavilion. It was a game that Head Coach Scott Balboni praised as a full 60-minute effort by the team. Solid goaltending by Ted Hume, good special teams play and four strong lines helped the Icers dominate at home. However, Saturday night would be a different story. The Icers came out flat, trailed 1-0 after 20 minutes and were down by 2 midway through the 2nd period. Domenic Morrone narrowed the margin to 2-1 with his 6th goal of the season in the middle frame before Tim O'Brien's 3rd of the season tied it up at 3:35 of the 3rd. Ryan Paradis gave the Icers their first lead at 15:38, but just 30 seconds later Steve Meade tied it up as Penn State ran around in their own end, winding up with Meade banking the puck into the net off the leg of Ted Hume. The teams couldn't decide it through overtime, with no last second heroics a week after Steve Thurston scored with 1 second left in OT at Ohio, so it was on to the shootout. Both teams counted twice in the first four rounds, but Eric Steinour missed before Ted Gilbert won it for the Golden Rams -- final score West Chester 4 Penn State 3. West Chester goalie Matt Murnane was the first star one night after getting yanked in the Icers win. The freshman netminder stopped 43 of 46 shots through the overtime, while Ted Hume was 23 of 26. Scott Balboni blamed the loss on a lack of effort and a lack of preparedness by the coaches, but the bottom line is -- the curse of the Ice Line continues to haunt the Icers. 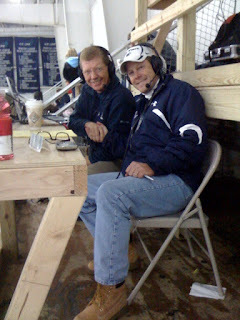 Despite the loss, it was fun having my good friend Steve Zodtner in the booth. Barb and I were supposed to play golf with Steve and Nina. Instead, we enjoyed their hospitality watching college football before heading to the arena. The Icers return to action this weekend with a home and home series with the West Chester Golden Rams, the newest members of the Eastern States Collegiate Hockey League (ESCHL). The Icers enter conference play ranked #3 in the ACHA, while the Golden Rams are #8 in the latest coaches' poll. Penn State is 3-1 on the season after last weekend's split at Ohio. West Chester opened the season with a pair of wins against Rutgers (5-3) and D-II William Patterson (7-3) before heading to last weekend's ACHA Showcase in Boardman, OH. The Golden Rams beat Michigan Dearborn 6-5 in a shootout last Friday night, before getting thumped 9-2 by Arizona State on Saturday and 6-1 by Oklahoma on Sunday. Despite the setbacks at the Showcase, the Golden Rams will be the latest team looking to knock the Icers down a peg. Remember back to last December, when the Icers took the opener of the home-and-home with a 3-2 shootout win at the Greenberg, before being handed a 6-4 loss at the Ice Line in West Chester. Jim Gehring had 4 goals for the Golden Rams in that series, and Robert Bushman notched a hat-trick in the win in West Chester. Both have graduated, but Pat Johnson is still with the team and is currently their leading scorer. We'll have both games this weekend on Fight on State, with Steve Zodtner joining me in the booth at West Chester on Saturday night. It's always fun to have Steve play Howie Meeker to my Bill Hewitt! You may notice a new title banner for the blog this morning. All thanks to my good buddy Rodney Martin, who apparently has better Photoshop skills than yours truly. I'll be getting a more professional video editing software package than the one that came with the camera, so that we can improve the look of the videos. Now, if we can just do something about the yellow lights at the arena. Maybe a new barn perhaps?? 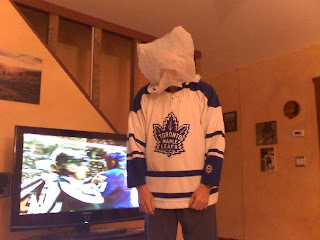 My Maple Leafs are now 0-5-1. Here's how bad it is. Darcy Tucker (not wanted by the Leafs) comes back and gets a goal and assist. Mike Komisarek scores an "own goal" with a header on a corner kick pass. As you probably know by now, the Icers wound up with a split of the weekend series at Ohio, thanks to Steve Thurston's last second goal in overtime on Saturday, giving the Icers a hard-fought 4-3 win. The team was given Monday off, with just an optional skate in the afternoon, so it wasn't until today that I was able to catch up with Steve. As he always does, the man they call "Sweet Lou" downplayed his heroics. Scott Balboni agrees with Steve, saying the team will have to be ready for this weekend's home-and-home series with the West Chester Golden Rams. Oh, about that "Foligno Leap." Here's a prime example from 1993 - the last year the Maple Leafs had a team I could actually feel good about! The Penn State Icers will be taking part in the 4th Annual Pittsburgh College Hockey Showcase at the Mellon Arena on Fri. January 8, 2010. The Icers will be playing the Robert Morris U. Colonials in the middle of three games at the home of the Stanley Cup Champion Pittsburgh Penguins. Oh, it hurts me to even type that! We have had great attendance the past three years and the only way to get the best seats in the house are through Ticketmaster. Igloo Club seats have gone fast and the rest of the building is general admission. Tickets are priced at $17 for Igloo club seats and $12 for general admission for all three games. Please take this opportunity to see the final college hockey games played at Mellon Arena. It's always a war when Penn State and Ohio meet on the ice, whether it's in State College or Athens. But tonight's game may have been the biggest battle that I've seen between the bitter rivals. The Icers needed an outstanding performance by Ted Hume to survive a furious OU attack and some infuriating officiating before Steve Thurston scored with 1 second left in overtime, giving the Icers a 4-3 victory and a split of the weekend series at the Bird Arena. For second night in a row, the Icers got on the board first. Kurt Collins finished off a nice three-way passing play from Chris Pronchik and Matt Kirstein. OU's Ryan Tessmer knotted the score at 1 on the power play with 51 seconds left in the first period. OU dominated the Icers in the second, outshooting the Icers 13-3, but Hume came up with some huge saves and neither team was able to score. That changed in the third, with Kirstein opening a three-goal flurry at the 11 minute mark. Just 11 seconds later, Josh Fodor buried a big rebound to tie it up, but George Saad scored his second of the season 59 seconds after Fodor's tying goal. Things got ugly at 16:38 of the third when a check from behind by Dan Loucks led to a 5-on-5 donnybrook. After an interminable delay while the officials tried to figure out just what the heck happened, the Icers had to kill off a 5 minute two man advantage for OU. With some great penalty killing, the Icers were 44 seconds away from the win, but Brad Holzemer found a loose puck and put it in the back of the net to send the OU fans into orbit. The Icers were down one man heading to overtime after Holzemer was sent off for tripping with 4 seconds left in the 3rd. An OU bench minor for too many men on the ice at 1:11 of the overtime gave the Icers some life, setting the stage for the dramatic finish. With about 10 seconds left in OT, Domenic Morrone streaked into the OU zone and circled around behind the net. It looked like time would run out and the game would be decided by a shootout, but Morrone spotted Thurston in the slot. The pass was right on the tape and Steve's shot got past OU goalie Paul Marshall a split second before the final buzzer. Thurston was mobbed by the entire team, luckily surviving serious injury in the process! The amazing win and the weekend split is a benchmark result for the young team. As Scott Balboni said in the post-game interview, the team came together, stuck up for each other and battled through adversity to come away with a split in one of the toughest places to win in the ACHA. It was their first big test of the season, and while the outcome isn't what the players, coaches, fans and - yes even the broadcaster - wanted, there were a lot of positives in Friday's 2-1 loss to the Ohio Bobcats. Penn State was playing just its 3rd game of the season, while OU entered the night with a record of 7 wins and 0 losses. The Icers were handed a gift win a week ago, while the Bobcats had allowed just 5 goals in 7 games. Most importantly, there were 6 freshmen in the Icers lineup - none of them having faced OU and the rabid OU fans while skating on the tiny ice surface at the Bird Arena. Scott Balboni and Bill Downey made the right move by starting the freshman line of Saad, Steinhour and Morrone, with Rich O'Brien lined up on the blue line for the opening faceoff with co-captain Steve Thurston. Ryan Erbe and Dan Loucks also saw substantial ice time on defense, and Loucks seemed to get stronger as the game progressed. The Kid Line came out banging, getting a couple of scoring chances in the opening minutes. The Icers continued to keep OU on its heels through the first half of the opening period, but the Bobcats began to battle back. At one point Penn State held a 6-0 shot advantage, but the teams ended the first scoreless, with OU outshooting the Icers 8-7, an indication of how tight the game would be. Ted Hume had a solid outing in net, robbing OU freshman Jonathan Pietramalla late in the first period. Penalties to Dan Loucks and Steve Thurston late in the period gave OU a 2-man advantage, but shortly after the Icers killed off the Bobcats' power play it was Domenic Morrone opening the scoring with his 4th of the season at 2:01. Michael Schultz tied it for OU with his 5th goal of the season at 16:34 of the second as the Bobcats outshot the Icers 10-6 in the middle frame. Schultz notched his 6th of the season at 6:50 of the 3rd period, a power play goal with Ryan Erbe in the penalty box. The Icers ran into penalty problems, thanks in part to some questionable calls by referee Sean Andring. In fact, both coaches gave the officiating crew an earful throughout the game. Unofficially, OU was 1 for 7 with the man advantage, while the Icers went 0 for 4 on the power play. Co-captain Matt Kirstein told me after the game that despite the loss, there were a lot of positives to take from the team's performance. Now that I've got the blog underway, it's time to take a stab at adding video to 'The View From the Booth'. Our first victim interviewee is freshman Domenic Morrone. Dom started off his Icers career with a 3-goal weekend against Towson. He says that playing in front of the Icers fans was an enjoyable experience, but I don't think he's expecting to feel the love this weekend at the Bird Arena! I caught up with Coach Balboni after practice. Gotta love the yellow lighting at the Greenberg. Next time, I'll use a different location! Scott hope the team will be ready for this early season litmus test against the Bobcats. "It's as it Should Be"
Those were the words of an Icers fan as he filed out of the Greenberg Ice Pavilion after Saturday's 15-3 thumping of the Towson Tigers. With no disrespect to the Tigers, the fan pretty much hit the nail on the head. Full credit to Towson for keeping it close through the first half of the game, with help from the Icers players. Once again on Saturday, the guys looked like they were squeezing sawdust out of those $200 composite sticks. And once again, it was the veterans that were leading the way in the gaffe stats. A 2-1 Icers lead after 20 minutes was negated just 55 seconds into the second when Towson's Ryan Larkin scored a gift shorthanded goal. The Icers could have folded like a cheap suit, but just 22 seconds later Marek Polidor notched his first of the season, giving the fans some hope. Matt Westcott brought the Tigers back into a tie at 4:18, but from there on it was all Icers. It looked like the light bulb went on in their heads, because all of a sudden the passes were connecting and the goals kept coming. Domenic Morrone scored two to open the floodgates, his 2nd and 3rd goals of the season. Morrone played on an all-freshmen line with George Saad (the OT hero on Friday) and Eric Steinour, who scored his first two as an Icer. The trio looked like they'd been together for months, creating some nifty playmaking while thumping bodies with some big checks. Morrone wears number 19, and on the ice he looks and plays like Brandon Rubeo. For one game at least, the line of Saad, Steinour and Morrone reminded me of the BUZZ line of Rubeo, Paul Zodtner and Jaime Zimmel. Steve Thurston scored a pair of power play goals, while Paul Daley and Nick Seravalli each counted a pair of tallies. Tim O'Brien, Kurt Collins, Dave Herel, Matt Kirstein and Chris Pronchik all got on the score sheet with their first of the season. At the other end, John Jay could have set up a beach chair as he faced just 15 shots while picking up the win and running his record as an Icer to 4-0. There's little time to savor a weekend sweep that shouldn't have been after Towson was hosed by the officials on Friday night. Ohio and the Bird Arena will be waiting next weekend. It will be interesting to see how the new guys deal with Gang Green and the small ice surface that over the years has been one of the toughest places to play for Penn State. No other way to describe it -- the Icers didn't deserve were handed last night's 4-3 overtime victory in a sloppy season opener at the Greenberg Ice Pavilion. In what can only be described as a bizarre finish, Towson's Mike Emmet scored his 3rd goal of the night on a shorthanded breakaway with just 12 seconds left in regulation time, appearing to give the Tigers a 4-3 upset win. But not so fast. The refs didn't see it that way. Although the puck clearly went five-hole on Icers goalie Ted Hume, off the back of the net and back out - the officials ruled that the puck hit the post! That set the stage for freshman George Saad's OT winner, a win that Coach Balboni said the Icers didn't deserve. Rightfully so! They (veterans and rookies alike) were guilty of some bad play, lack of intensity and looking past the Tigers to next weekend's trip to Ohio U. The team will need a much better effort this afternoon in the second game of this opening weekend. The Tigers will be looking for some revenge for a win that was taken away from them. That is the case in hockey, so it's going to be a challenge for the Icers this season with so many new faces on the blue line. Steve Thurston, John Conte and Carey Bell logged lots of ice time last season, while sophomores Dan Petrick and Alan Clark didn't. Another page on the calendar is turned, the leaves are turning too -- and suddenly it's hockey season! The Icers got things kicked off last Friday with the annual Blue/White game, with the veteran-laden Whites laying a 6-2 beatdown on the Blues. All in all it was about what you'd expect from a scrimmage, but the hits will be for real on Friday night when the Icers open the regular season hosting the Towson Tigers. Towson comes in after splitting a pair with Navy last weekend, beating the Middies 4-2 before being blanked 4-0. The Tigers will be a good test for the re-tooled Icers squad before they head to Athens for a rare early season matchup with long-time rival OU. Tonight, I'll be planted firmly in front of my TV as the NHL season kicks off, and I'm hoping my other blue and white team doesn't break my heart again this year. Speaking of re-tooling -- Brian Burke and Ron Wilson have totally revamped the Toronto Maple Leafs, with 10 new players on the roster tonight as they open at the Air Canada Center against the Montreal Canadiens. I don't care how you cut it, this is THE rivalry in hockey, despite the down years by the Leafs over the last - oh, quarter century or so! Should be fun, even if the NHL can't be bothered to put the HD feed on its Center Ice package. Burke and Wilson promise that the Leafs will be bigger and tougher. Icers head coach Scott Balboni is promising the Icers will be bigger and tougher. Coincidence that all three played their collegiate hockey at Providence College? Hmmm.